Remember last Wonder Fest and the slew of awesome merch that was revealed for Studio Trigger’s upcoming SSSS.Gridman Anime? 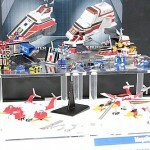 One of those products shown was the small-scale Actibuilder SSSS Gridman, and he’s finally ready for production with a plethora of images having come out via Figsoku. MegaHouse’s Actibuilder SSSS Gridman will see a release in March 2019. Collectors will be able to choose from two options: either the figure stand-alone or in a set with the auxiliary vehicles. 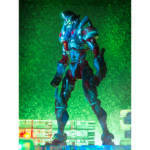 To get the complete set, you’ll need 16,800 yen while the stand-alone figure will run you 5250 yen. Keep in mind that this figure stands at about 10cms tall, so it will be a tad small if you collect the S.H.Figuarts line. It’s a double whammy of SSSS Gridman merch today. We’ve seen Goodsmile take on Studio Trigger’s SSSS Gridman but now Megahouse will be throwing their hat into the ring as well with the ActiBuilder SSSS Gridman line up. Unlike the big boy Goodsmile is working on, Megahouse’s Actibuilder SSSS Gridman appears to be going in the opposite direction by releasing these designs in a much smaller scale. 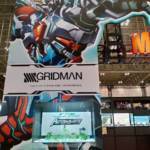 We can only assume that from the name, Gridman can combine with his auxiliary machines but unfortunately there isn’t much to go on aside from the impressive display MegaHouse has for this action figure line at Wonder Festival, at this time we aren’t exactly sure what this toy line will end up being. Stay tuned though, and we’ll provide you more up to date info as it becomes available. Action Works Metalder Gallery In Honor of VR Troopers 20th Anniversary! It’s time to take a moment out of your busy schedule to celebrate VR Troopers recent 20th Anniversary! Although this series may not be like the Power Rangers juggernaut of today, it’s still a classic! Spliced together from 3 Metal Heroes shows (Chojinki Metalder, Jikku Senshi Spielban, & Uchuu Keiji Shaider) VR Troopers was one unique product. The biggest reasons why the show still gets love is the very awesome actor who played Ryan Steele, Brad Hawkins, whom you may also know as the voice of the Zeo Gold Ranger! In honor of this momentous occasion TokuNation is proud to present the Action Works Chojinki Metalder gallery! Released in Japan in September 2009, coincidentally then VR’s 15th anniversary, Action Works Metalder should appeal to any fan of VR Troopers or Metalder. Though not an S.H. 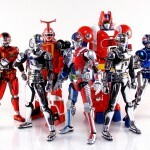 Figuart, Action Works Metalder is more than on par with that line even by today’s standards. There’s no way of knowing when or if we’ll see S.H. Figuarts Metalder/Ryan Steele from Bandai so for now this figure is the perfect stand it for any collection. Though it’s 5 years old it faithfully recreates the incredible Metalder suit perfectly and includes a compliment of great accessories such as his signature Katana and his robotic partner/brother Springer! VR Troopers turned 20 this year and despite not having much in the way of new merchandise to support it, love for the series is always growing. For now, throw your support behind an awesome guy and follow Brad Hawkins on Twitter @VRBradHawkins. And be sure check out 60 images of this amazing figure after the jump with more than a couple group shots to make Metal Heroes & Saban Heroes fans very happy. In addition, Megahouse also had on display a new Chess Piece collection featuring Kamen Rider. AmiAmi has put up a preorder for the Panel Games FPC Tokumei Sentai Go-Busters Team Dash! 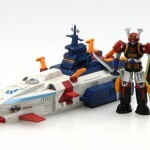 Set The set consists of the Go-Buster Team members and their Buddyroids, as well as the combined Megazord, although they are in a chibi style, the figures feature rather detailed look at the next addition to the Super Sentai franchise. It’s priced at 800 Yen.